Here is a book project I have been working on with Kristoffer Fynbo Thorning and Tine Fris, both Danish musicians who also enjoy collaborative group processes. They have combined their interests into a book filled with icebreakers that focus on musicality and movement to help groups get into the groove. The book is still in progress so at the moment I can only show the cover design and a few illustrations from the exercises in the book. Design-wise, the client wanted a fun and informal look while still feeling professional enough for a variety of groups. An illustration style was developed to clearly show exaggerated body shapes, emphasize movement & sound, as well as maximizing the quantity of illustrations created for a start-up budget. Icons for four main categories of icebreaker. 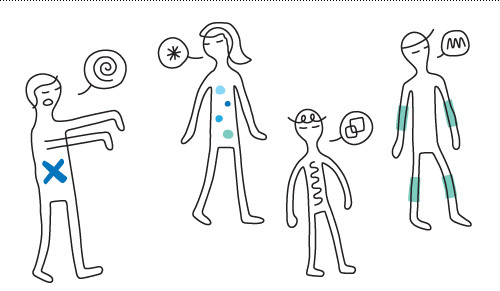 Illustration for the icebreaker “body jazz”, where participants use different body part movements in conjunction with sounds to create a group song. Illustration for the icebreaker “memory”, which involves matching pairs of body shapes, sounds or movements that people perform for the game player. Illustration for the icebreaker “zombie”, in which participants use unique sounds to let the ‘zombie character’ hone in on their prey while trying to escape – all with eyes closed. On a personal note, I saw Kristoffer, Tine, and their musical group Postyr Project perform a concert in Copenhagen at a local church. The exact opposite of a born again revival, it was an evening of interesting a cappella combined with digital experimentation (imagine a singer waving their hands over an iPad to control a series of sound loops while funky IKEA lights turn on and off in the background depending on what tones are sounded). AND there were snacks and alcohol served afterwards in the vestibule. That’s just how the Danes roll. Here is one of my favorite songs from the evening called “My Future Self”. It was performed live pretty much in the same incarnation using four voices and an iPad. 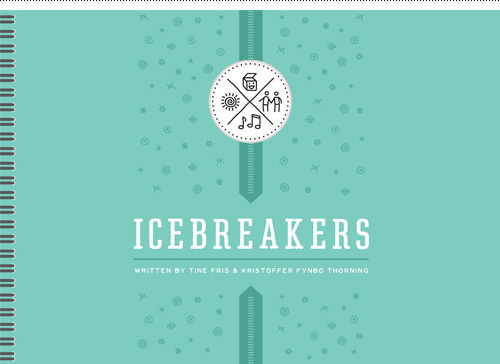 Check out their website for the Icebreakers book here, where they also have an IndieGoGo campaign in progress for helping fund production, outreach, marketing, and design.